Elephant's Ear is an exotic house plant with striking foliage. Wiping dust from the metallic-looking leaves can damage them. Instead, clean the leaves by spraying them with room-temperature water. 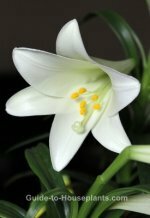 Thick, upright stems carry arrow-shaped leaves with scalloped edges. Bold silver-green veins make a dramatic pattern on glossy, dark-green leaves. Alocasias grow from rhizomes, which can be divided in spring for more plants. Each rhizome produces several leaves that grow to 1 ft (30) long, making Elephant's Ear a sassy, new accent for your home. Put it on a pedestal stand to show it off. Just like other members of the Araceae family, its flowers are composed of a spadix surrounded by a spathe. On this plant, however, they are insignificant. It's the spectacular foliage that makes this tropical native well worth growing. Few indoor plants are as eye-catching as this one. Even young alocasias stand out, but will soon reach 2 ft (60 cm) tall or more. 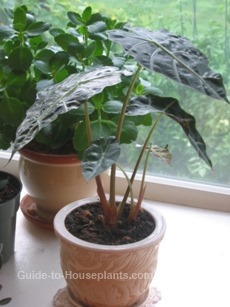 Set alocasia in a bright location and keep it warm all year. 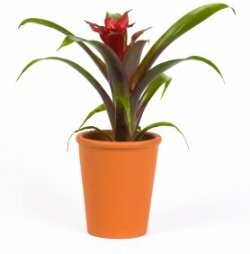 With good care, you'll enjoy this exotic house plant a long time. This tropical house plant can be somewhat fussy, prefering the high humidity of a greenhouse to an average home. However, a room humidifier and frequent misting of the leaves will give it the moist air it craves. Regular misting also helps to keep away red spider mites that are attracted to dry conditions. Repot in spring when necessary. Use a container with drainage holes to prevent root rot. Give your plant a rest period in winter, allowing the soil to become almost dry between waterings and stop fertilizing. It may go dormant if it dries out completely. But don't give up on it -- it'll recuperate in a month or two with good care. Continue to provide plenty of humidity with a pebble tray or misting every day. 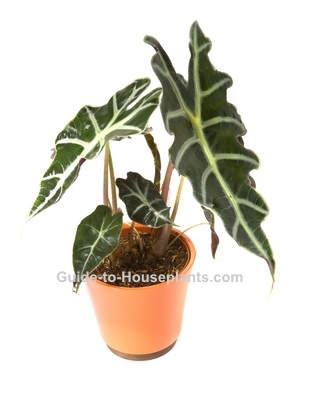 You'll find Alocasia for sale in garden centers and online nurseries in spring and summer. A. x amazonica 'Polly' is a popular cultivar that stays compact. Water: Keep soil moist spring through fall when plant is actively growing. Water sparingly in winter, allowing soil to become almost dry between waterings. Humidity: Requires moist air, preferably 50% relative humidity or higher. Use a room humidifier for best results. Temperature: Average to warm 65-75°F/18-24°C. Fertilizer: Feed every 2 weeks spring through fall with a 20-10-10 liquid fertilizer diluted by half. Do not feed in winter. Propagation: Division. Divide rhizomes in spring and pot in separate containers. Keep the top surface of the rhizome above the soil line so that the growing stems don't rot at soil level.